I was not attempting to make a flourless chocolate cake. However, I made a very good one, even though I was able to eat only a very small amount of it. This is my first post since starting this website that I made something that, quite frankly, did not work out. What I learned tonight is that there is a very short list of things I should never again try to make (unless I can get a tutorial from someone who knows how to make it) and should let other people make for me. This list only includes two foods (everything else I either can make if I try to, or have no interest in making, or haven't yet tried), which are: 1) saltwater taffy; and 2) baked alaska / meringue. Also, tonight's lesson is sometimes you don't have to make the most complicated thing in the world - i.e. a baked alaska. A chocolate cake or something less exotic is usually just fine as long as it looks and tastes good. (Having said that, I will be making creme brulee tomorrow). In all fairness, I am sure with a little practice, I could figure out gnocchi. It just didn't work out the one time I tried. But the other two were colossal disasters. Candy making is very precise (more so than even baking) and you must use a candy thermometer to get the temperature exactly right. I tried making saltwater taffy using a recipe from a science museum (I think in Chicago). I used the candy thermometer I had - a thermometer a friend of my mom's gave me years ago in case I ever wanted to make candy. Little did she know 20 years later I would actually try . . . I think part of the reason it didn't work was because the candy thermometer may no longer be calibrated correctly after all these years, something that never occurred to me until after the fact. The first time I made a hard candy (not terrible, just not saltwater taffy); the second time I made a gelatinous gooey mess. I bet I could get it right with a new thermometer, but honestly, I don't need to waste anymore time making taffy than I already have when I can make rainbow cookies and fondant cakes and pasta dishes instead. I will eventually invest in a new candy thermometer though. First, beat the sugar and egg yolks in your artisan mixer (if I haven't yet convinced you that this machine is the coolest thing since the invention of the wheel, I don't know what else I can say to encourage you to buy one). You should beat at medium speed until pale and yellow, for about 10 minutes. Then add the melted chocolate and vanilla and mix to combine. Next take the chocolate mixture out of the artisan mixer and put in a bowl. If you have a handheld mixer, like I do, you can leave it in the artisan mixer and do the next step using your handheld. Either using a handheld mixer or artisan mixer, beat the 3 egg whites until stiff and fluffy, with a inch of salt and 2 T of sugar, and then fold this mixture gently into the chocolate mixture, using a spatula. Be gentle. 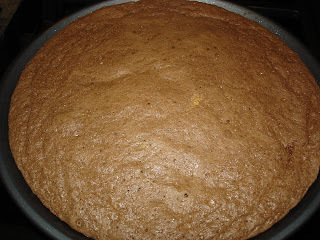 Spray a pan with pam and put into a circular 8 inch cake pan. Bake in your preheated oven for 20 minutes at 350. The end result should be a light and fluffy but decadadently chocolate cake. If you are smart, you will stop here and enjoy eating the cake. If you're like me, you might experiment further. I decided to top with ice cream, make meringue on top and put in the oven, to make a Baked Alaska. It did not work, and in fact resulted in a sticky mess. Basically my delicious cake was covered with a pint of melted ice cream and gooey marshmallow fluff. Note: the oven is still clean but when we tried to cut the baked alaska it was melted and gooey. The cake underneath was still great though. I am great at making stiff peaks with eggs - I can make awesome souffles for this reason, and pretty much anything else requiring puffy egg whites. But I cannot make meringue, no matter what I do. I guess even in doing our passions we have our shortcomings. I made a gooey marshmallow mess that was about 50% meringue like. If you ever bought a jar of marshmallow fluff (I used to live next door to Peanut Butter & Company on Sullivan Street, which by the way, has the best cinnamon raison peanut butter ever), you know what I actually made. It did not create a proper seal for the ice cream, and let's leave it at that. My husband was less than thrilled about the cleanup but at least it didn't get all over the oven. My mom told me later that she once made meringue and her Baked Alaska and it worked out fine. She said we should make it together. So perhaps Baked Alaska will have it's chance to succeed with me cooking with my mom - in her kitchen, using her oven!! If you have tips on how I can make a better meringue and Baked Alaska please comment here and let me know. I feel like I should at least figure out the meringue part someday without wasting anymore eggs and sugar since I hate knowing that there's something I can't cook/bake. Hope you enjoy the flourless chocolate cake in the meantime. My husband has requested that I make it again soon so he can actually eat it!